Councilmember Atkins [attempting to add a condition restricting convenience stores]: Let me ask about convenience stores. That was of particular concern I heard from someone, if not today, in the last week or so. Can you respond to that? Allard Jansen: It's a tough question. What's a convenience store? That's where I'm struggling with that. 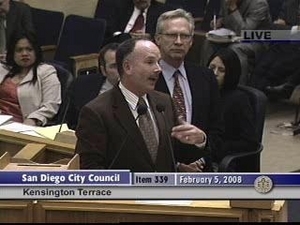 Councilmember Atkins: Then I won't throw that in, but what I would ask is that there be some discussion about that definition, and I would like to know -- I would like to -- maybe you can come back to me on that. I don't have to put it in this motion, but I would like further discussion. Allard Jansen, struggling to remember what is a convenience store, after scaring the community for two years with the thought that one might appear where the gas station now is. Yet he refused Atkins' request to agree to restrict a convenience store as an allowable use for Kensington Terrace, thereby bypassing Atkins in the race for the coveted Height of Hypocrisy Award for 2008. HEY, KENSINGTON! This Circle-K is brought to you by the Jansen-Vann Consortium! The brief filed by attorney Sandra Brower New! 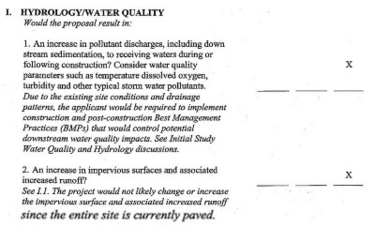 The report by Environmental Analyst /Planner David Potter New! The report from noted historian Ronald May New! The recommendation to preserve community character from SOHO New! The analysis and recommendations from Walk San Diego New! HOW MANY WORDS DOES IT TAKE TO SAY “PAID PARKING”? Atkins: In terms of the required parking … Can I ask you, will there be any thought to making some of those spaces available to the public? Someone might want to park there and go over to the library…. It's great that you have 22 extra spaces. I think in urban communities, I know, me and Mr. Peters may disagree on this. But I find when you don't allow enough parking, it does cause problems. I drove down Marlborough today. Granted, people are voting at the church, but there was not a place on Marlborough to park. Is that something that you would look at, in terms of shared parking? Atkins: There would have to be some agreement worked out to allow for that, correct? Mitch Berner: Correct. The examples I'll use, the lowest floor of the parking is intended for residents only. That would be secured for the use of the residents only. The level above, which is the first floor as you enter – the example I use is that the Hillcrest Cinema – they operate off of a receipt system. If you're going into that shopping center, everybody gets a parking sticker. If you do business in that center, you get validated, no cost for the time you're there. There's time limits, much like Horton Plaza has. The intent is to extend that service to the adjacent restaurants and other retailers to say, after hours, when it is open to the public, everybody can use it, but we want to first make a gesture to the other retail uses that are parking short. They, too, can participate in the validation system, so that their patrons can choose to park in this building or not. Atkins: So that would be paid parking? Mitch Berner: Not necessarily. The example I use of the validation system, this has not yet been determined with whom those agreements will be struck. We may choose to have a reciprocal parking agreement where they may participate in that validation system, they don't own or control the building, but we've entered into an agreement that would allow them during the business hours and their patrons to use this building without necessarily a charge. Will there be a charge? I can’t say. 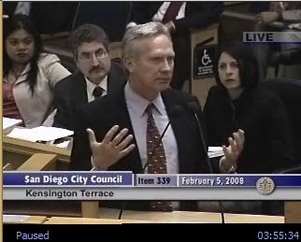 And now our favorite City Traffic Engineer again avoids answering a direct question, which will come back to haunt the City Attorney very shortly. Atkins: That's my next question. To designate that delivery trucks, that the route – I want it know if you can do this and I’m asking the attorney to monitor and help me here, I want to know if you can designate that delivery trucks, the route that they must take should be I-15 to Adams Avenue, and no other route, including Aldine Drive. And my rational for this, if delivery trucks are delivering to Adams and right at your project, they can take I-15. If they're delivering stuff off of El Cajon Boulevard, they can -- I am concerned about heavy trucks coming up Aldine Drive, and people need the bus route. It is a connecter from Talmadge to Kensington. There are many residents who would not like that closed. I am concerned about heavy vehicles on Aldine Drive, and if you can put in the leases that the delivery trucks use I-15 and Adams Avenue and specify out that Aldine Drive not be used because that is a residential area. Jansen: We would agree with that. We'd work with traffic to make that happen with some kind of signage and then work with the leases and tenants and when we start our negotiations we will make that condition. Deputy City Attorney: I would need to know if there would be any impact to the traffic analysis that was utilized for the MND such that this change would warrant additional traffic analysis and perhaps recirculation of the MND, so if you could address that and also any other concerns that you might have. Development Services, Senior Traffic Engineer Labib Qasem: I believe that restricting deliveries to come from I-15 should be easy to control. I think we could add a condition to that. But in addition to that, I would like to also suggest that during construction, similar activities for, during construction, heavy trucks coming through, not just delivery after the stores are open. Atkins: I haven't gotten to that. A lot of that was in the MND in terms of people who are concerned. YET NO MENTION OF DELIVERY ROUTES OR CONSTRUCTION TRAFFIC ANALYSIS AND MITIGATION WAS IN THE MND! This is just the sort of thing that the Grand Jury was talking about in its Case Study on Kensington Terrace. And on the left, still available from the Planning Commission hearing, are the presentations made by various residents. You can view the PowerPoint slides that accompanied the presentations made by neighborhood residents during the November 15th meeting. We explain what's wrong with the Environmental Study, especially the traffic study, we review the actual character of our commercial district, not just a long, lingering look at the Starbuck's building, and we address all of the other impacts that should have been addressed had the job been done properly. It's all part of the public record now.